Center cut blades, cuts mild steel (Brinel 140) (80,000 PSI) to 5/32" diameter, cuts hard steel (HRC 44) (208,000 PSI) to 3/32" diameter. Do not use cutters on energized circuits, wire, or cable. Steel handle, weighs 1/2 lb. Made from drop forged from high carbon, alloy steel for long life and durability. Opposing concave cutters are hand finished and induction hardened for long life and clean cuts. Used for cutting coaxial and other soft cables. Bi-material grips provide a comfortable and secure grip. Made of polished, high carbon, drop forged steel. Broader handles for better leverage and extra comfort; heat treated to hold their edge; cuts up to 4/0 aluminum and 2/0 soft copper. Not for use on steel or ACSR cable. Channellock Blue comfort grips. Made in USA. High leverage jaws with shear-cut blades; fits into most tool pouches; non-slip grips. This is not an insulated tool, do not use on energized circuits, wire, cable, cut steel or ACSR. High-leverage deisgn for exceptional cutting capability of 4/0 aluminum, 2/0 soft copper, 100-pair 24 AWG comminucations cable; precision, one-hand shearing action; cable-gripping shear-type jaws; perfect for working in confined spaces; can be carried in most tool pouches. 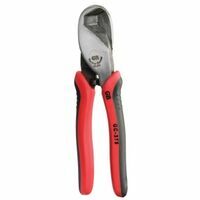 Top quality, pocket size cutter with shear cut blades for use on 3/16" hard wire rope or cable, 1/4" soft wire rope or cable, piano wire, or aircraft cable. Weighs 1lb. Coated steel handle. Not for use on any cutters on energized circuits, wire, or cable. Lightweight, rugged cutter, made of drop-forged, alloy tool steel jaws with shear-cut blades. Cuts copper or aluminum, power and communications cable; weighs 4-1/2 lbs.